Much like the game that inspires its name, Hangman is filled with blank spaces; but unlike the game, it’s not a puzzle worth solving. 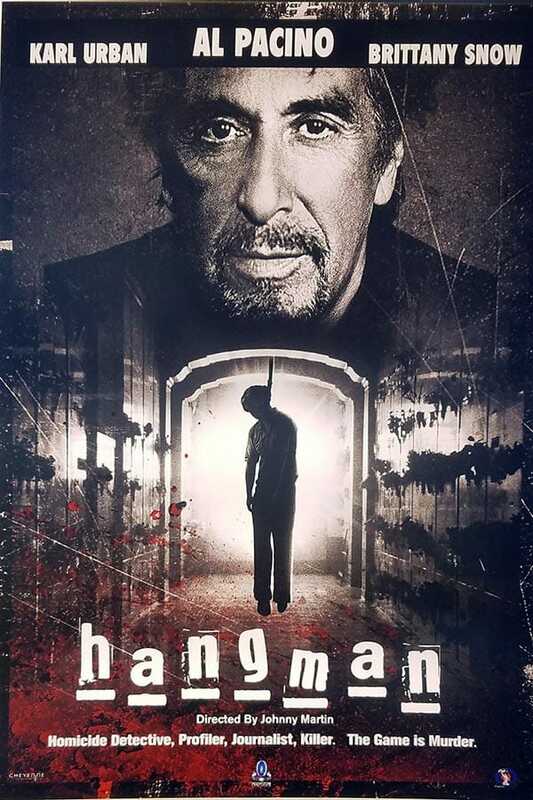 Veteran policeman Ray Archer (Al Pacino) and former colleague and criminal profiler Will Ruiney (Karl Urban) are tasked with chasing down a serial killer hellbent on completing a game of hangman one victim at time. Screaming give me my payslip this film is poorly cast, and stinks of a lack of effort. Brittany Snow plays the archetypal truth is power journalist who follows their investigation throughout but struggles to find any kind of depth or interest in her character. Al Pacino plays Al Pacino as he wades his way to the end of his career and Urban just seems to be…there. Using all of their forensic and profiling knowledge coupled with Pacino’s street smarts, you’d think they could solve the crime easily; Yet they seem to completely ignore the letters carved into the victims chest as if they’re there for the lols of it. For a film called hangman, the Hangman aspect appears to be strangely underused and often irrelevant. Hangman is like taking a test you know all the answers to but being forced to watch someone else struggle. The characters plod through the clues as you wait for them to come to the obvious conclusion and what could be a good TV movie doesn’t even live up to that. From moment one I struggled through Hangman; and despite it taking the best ideas from Se7en and The Bone Collector it comes nowhere near their level and is a horribly disappointing film. Even for the biggest Pacino fans, this is a film where burying your head in the sand and pretending it doesn’t exist is actually a good idea.